MaxisONE Club: Enjoy Exclusive Offers and Deals on Lazada Malaysia! Are you a member of Maxis One Club? Do you love online shopping? Then we at Lazada Malaysia have great news to tell you! In a special collaboration with Maxis Malaysia, we are pleased to tell you that now every 28th until 30th of every month, Maxis One Club members are eligible to enjoy a 15% discount on more than ninety thousand products across all categories! If you have been eyeing for that one item for all this while, now is the time more than ever for you to grab it while stock lasts! The available Maxis One Club offers do not stop there. Every 28-30th each month, you will be also able to shop the selected items and products for only RM 1 with the MaxisONE Club RM1 Flash Deals! Grab the Best of Deals and Offers on Every 28th to 30th of Every Month! If you love to online shop, why don't you wait until 28th of every month? For three days in a row, you will be able to shop during the MaxisONE Club PayDay where you can find ten of thousands of products are selected and curated so that MaxisONE Club members are able to shop them for an additional 15%! Now you can even save more when you come to shop here on Lazada Malaysia! All you have to do is to download MyMaxis app, then select "Maxis Deals" > "MaxisONE Club". If you are not a member of MaxisONE Club, you can click on shopping instead! Once you have selected MaxisONE Club, you can proceed to choose the deals that you are interested in before you download the deals that you want. So, what else are you waiting for? Become a MaxisONE Club member and come shop on Lazada Malaysia for the deals and offers that you would not find anywhere else! Why Should You Shop with MaxisONE Club? Every 28th until 30th every month, you stand a chance to get 15% discount on more than ninety thousand products! During the same period, you also can shop exclusive products for only RM1 with RM1 flash deals! 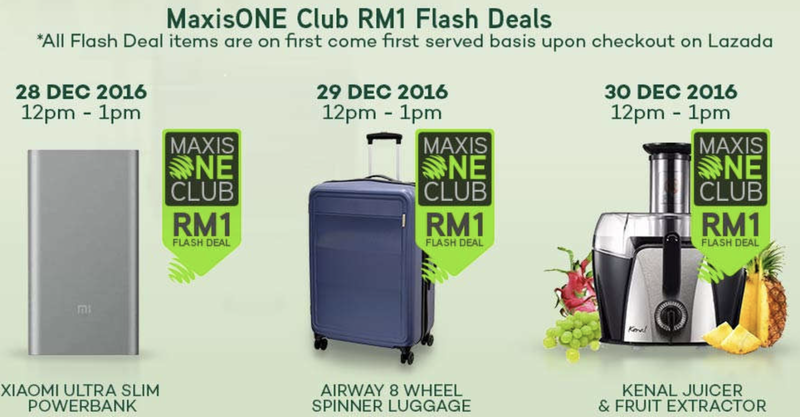 The available offers and deals are only exclusive to MaxisONE Club members! MaxisONE Club PayDay starts today! 15% off over 100,000 items on Lazada as well as RM1 Xiaomi Ultra Slim Powerbanks, Airways 8 Wheel Spinner Luggage bags, and Kenal EX-362 Juicer & Fruit Extractors! *All Flash Deals items are on first come first served basis upon checkout on Lazada.